Tate Britain’s latest blockbuster exhibition Watercolour opens officially tomorrow and runs until August 21st. It promises to be a crowd-pleaser even if apparently, or so the Tate hints, the public love this art form for all the wrong reasons. Watercolour is the most democratic of art mediums. Relative to oils, the paint is cheap, easily portable, and can be applied to paper rather than canvas. In its purest form, it is unforgiving; mistakes can’t be painted over. It provides proud parents with their infant’s first daubs and for grandparents a hobby later in life. I would have liked to have seen some recognition given to amateurs. This is, after all, an exhibition about a painting technique rather than famous artists. It must pain the exhibition’s main curator Alison Smith that Prince Charles is the UK’s best known living watercolour painter. 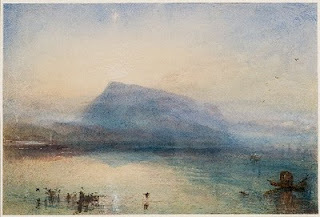 She prefers to labour the point about the many misconceptions attached to watercolour– that it’s subject matter is predominately landscape; a British enthusiasm, and that its golden age was roughly between 1750 and 1850. The show covers 800 years of watercolour with over 200 works and just about fulfils its unspoken goal of demonstrating both the technique isn’t the preserve of soft subjects and has a relevance to today. That said the Turners in the exhibition – like The Blue Rigi, Sunrise which heads this post – are a league apart from most of the rest. The room devoted to Watercolour and War is an ill-judged lapse into the thematic but nothing compared to the big blunder – Karla Black’s Opportunity For Girls, an installation that utilises emulsion. acrylic paints, Vaseline, shampoo, hair gel, toothpaste, and (somewhere) watercolour. This is the last work in the exhibition – I suppose conveniently placed for anyone panicked by the speed of the descent from the sublime (Hilliard, van Dyck, Blake, and the Turners) to the ridiculous. The Tate’s admission prices - £12.70 (£10.90 concessions) are head spinning too. I attended a private view today by virtue of my Tate membership, a much appreciated birthday gift. It is rich that the public has to pay to see things which are often part of the Tate's collection.